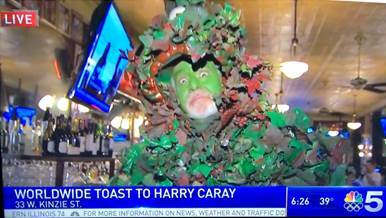 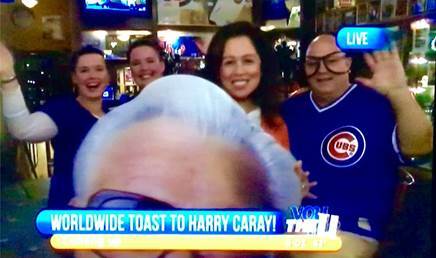 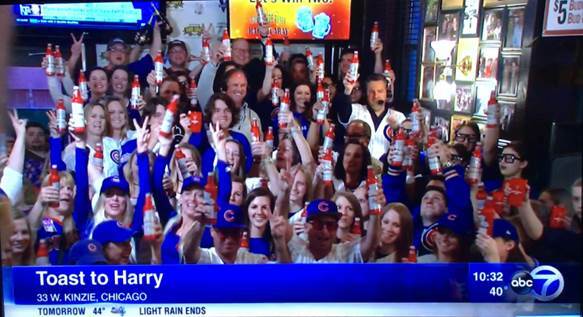 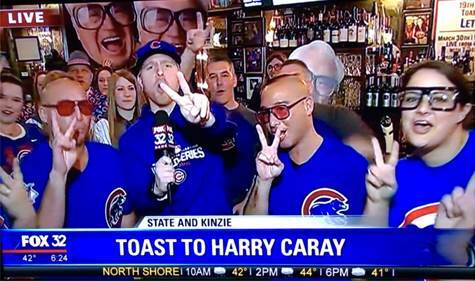 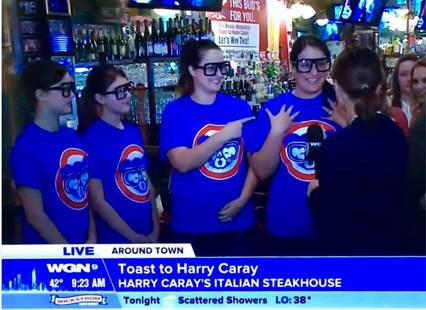 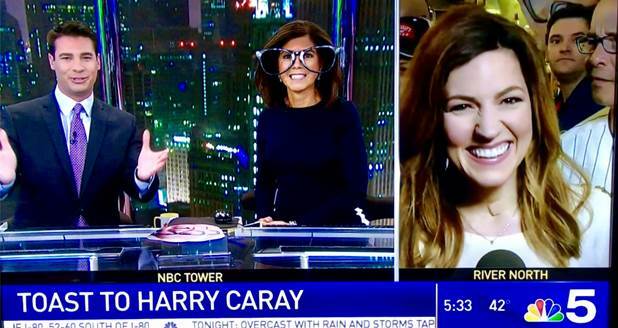 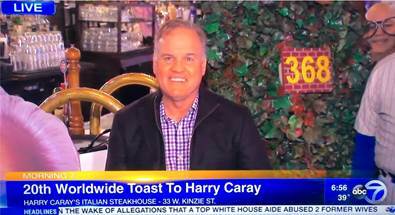 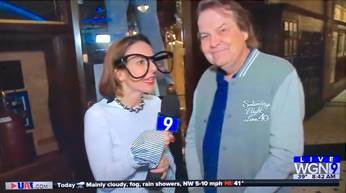 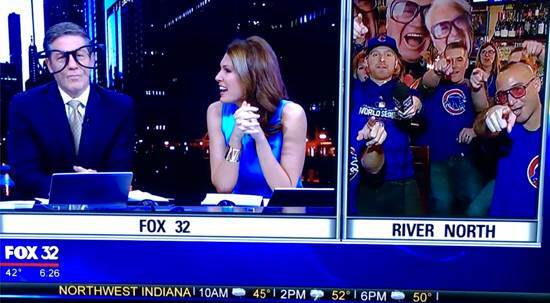 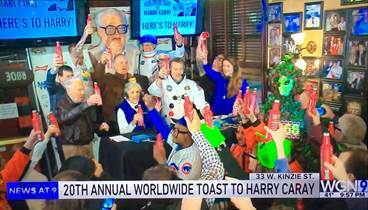 Every year since the passing of legendary Hall of Fame baseball announcer Harry Caray, fans around the world have raise a glass to his memory during the annual Worldwide Toast to Harry Caray. 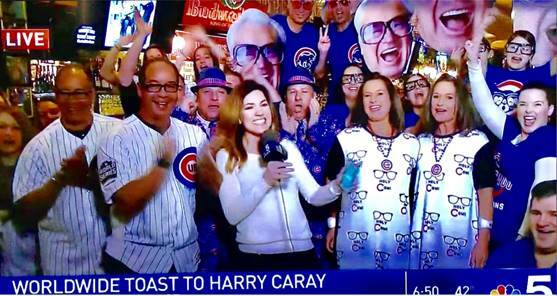 Over the years, more than five million fans from all 50 states and over 200 countries have joined in the annual tribute to the legendary baseball broadcaster. 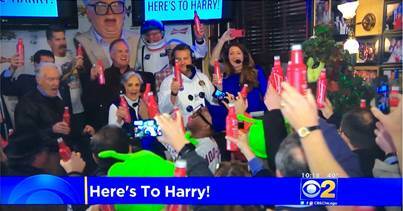 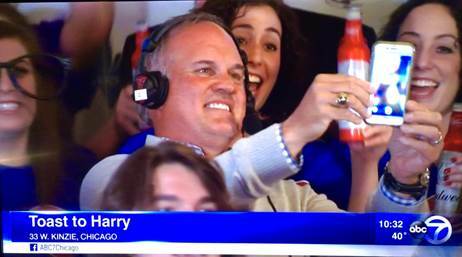 Harry, who was known to fans as the Cub Fan Bud Man, estimated that he consumed over 73,000 Budweiser’s and 300,000 alcoholic beverages during his lifetime. 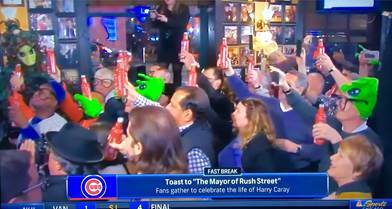 The Toast has been featured on countless television shows and newspapers from The Today Show to Good Morning America to the LA Times to the front page of the New York Times. 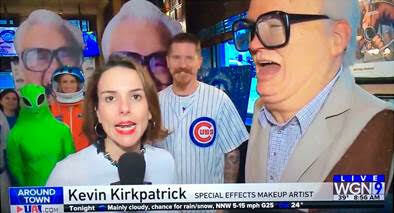 Numerous celebrities have joined in the tribute over the years, including former President Bill Clinton, Will Ferrell, Bill Murray, Eddie Veder, Billy Corgan, John Cusack, Harold Ramis, Bonnie Hunt, James Denton, Vince Vaughn, Joel Murray, Jim Belushi, Kerry Wood, Ryan Dempster, Frank Caliendo, Jeff Garlin, Gary Sinise, Joe Mantegna, Steven Soderberg, Brian Urlacher, Katie Couric, Bob Costas, Keith Olbermann, Bill Kurtis, Cheap Trick, Max Weinberg, Tom Ricketts, Marv Levy, John McDonough, Ernie Banks, Ryne Sandberg, Ron Kittle, Richard Dent, Patrick Kane, Bobby Hull, and Otis Wilson. 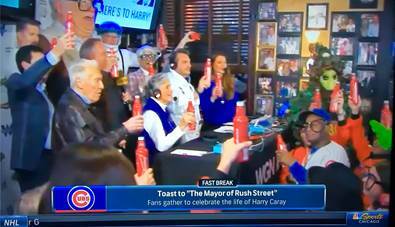 The video below includes clips from many of the Toasts that have been held over the years. 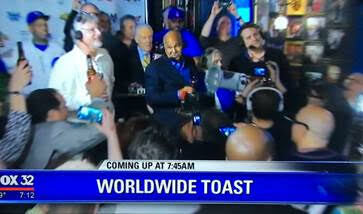 The Toast has been featured on countless television shows and newspapers from The Today Show to Good Morning America to the front page of the New York Times. 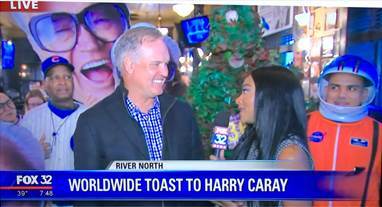 Below are descriptions and sample screen shots from coverage of our most recent Toasts. 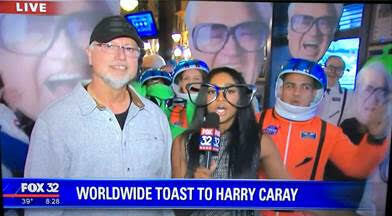 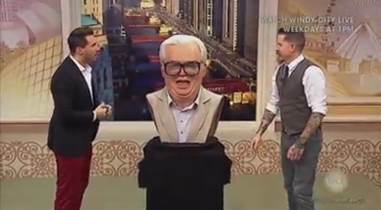 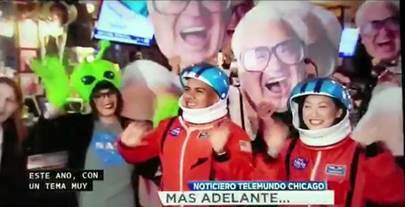 The theme was a nod to Will Ferrell’s popular Harry Caray SNL skit and also because Armageddon, Deep Impact, Star Trek and other space movies dominated in 1998 (the year of Harry's passing). 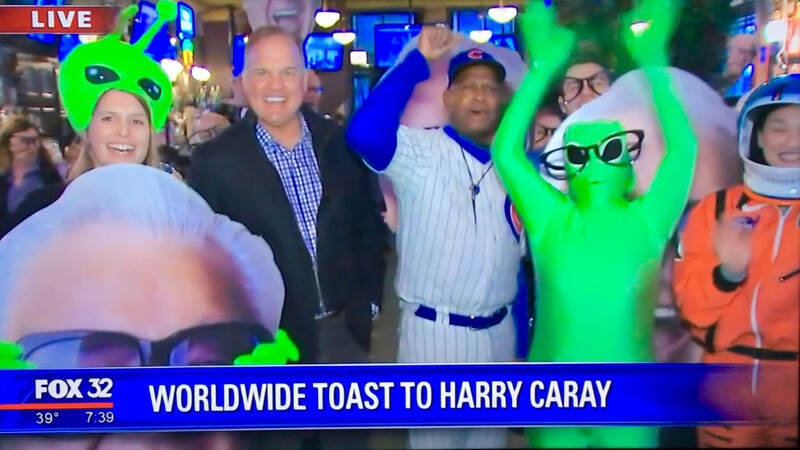 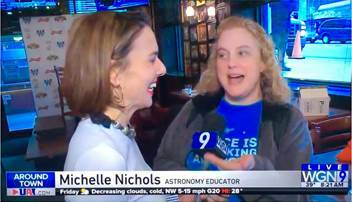 In addition to Ryne Sandberg and other Chicago sports celebrities, we were joined by representatives from the Adler Planetarium, who brought moon rocks and meteorites, and the curator of Saturday Night Live: The Experience, who brought Will Ferrell's Harry Caray costume from SNL. 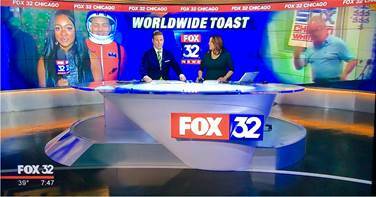 ​Coverage included: ABC News, CBS News, Fox News, NBC News, NBC Sports, Telemundo, Windy City Live, WGN News, WGN Radio (Roe Conn Show Live Broadcast), Chicago Sun Times, Chicago Tribune. 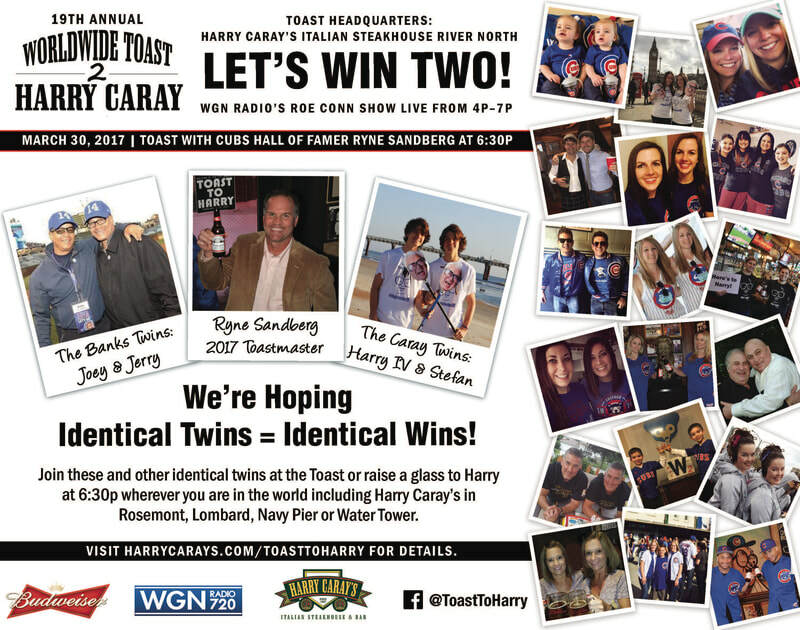 Following the historic Cubs 2016 World Series Win, the 2017 Toast theme embraced twins, as well as Ernie Banks' famous saying, "Let's Play Two." 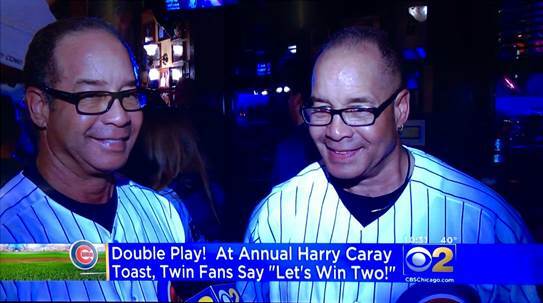 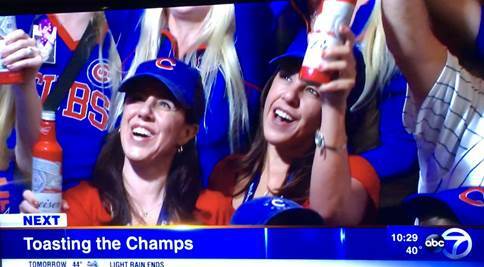 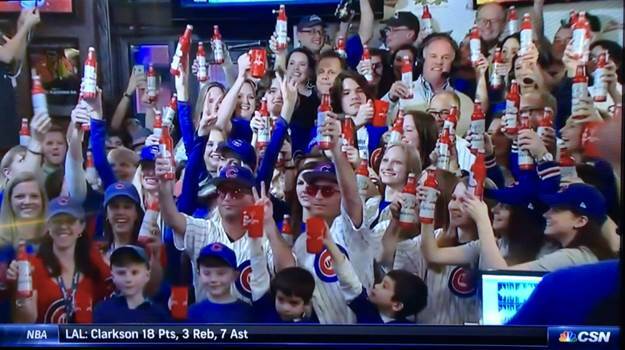 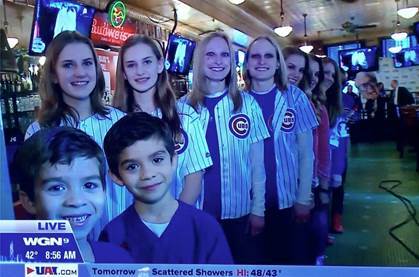 Hoping that identical twins=identical wins, we invited identical twin Cub fans to join us for the Toast. 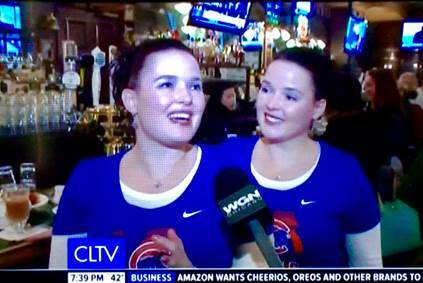 Over forty sets of identical twins joined us for the event, from as far away as Arizona, California and Florida. 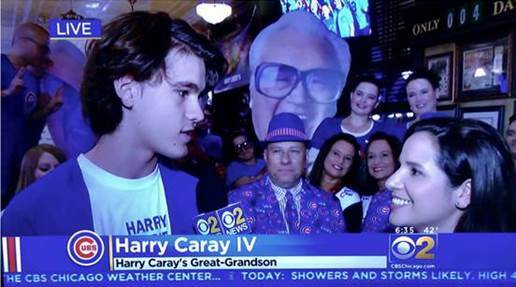 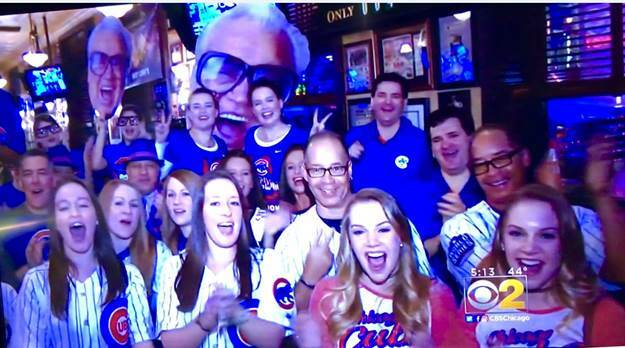 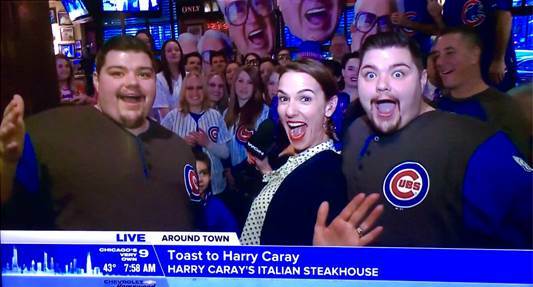 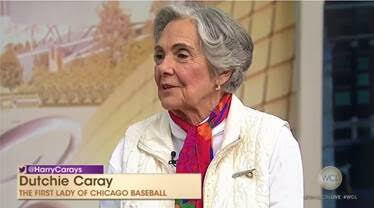 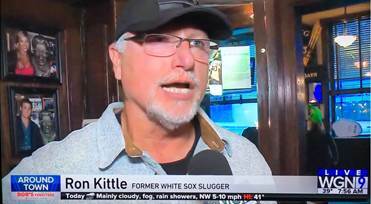 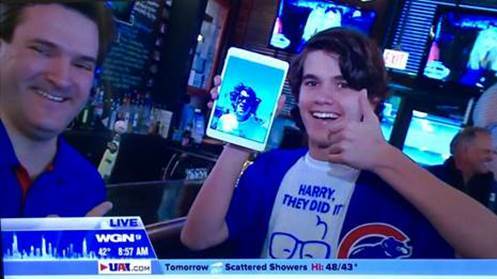 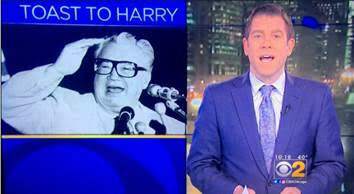 Harry Caray’s identical twin great-grandsons, Harry Caray IV and Stefan Caray, and Ernie Bank’s twin sons, Jerry and Joey Banks were among them. 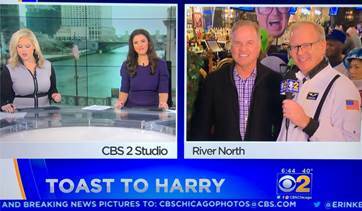 Coverage included: ABC News, CBS News, CLTV, Comcast Sports Net, Fox News, NBC News, WCIU, WGN News, WGN Radio (Roe Conn Show Live Broadcast), Chicago Sun Times, Chicago Tribune.